My sewing is also pretty maternity focused, these days. It seems like overnight I went from wearing regular jeans to needing gigantic stretchy panels in every garment. Apparently, that's a thing that happens when you're seven-and-a-half months pregnant. While many of my current projects can eventually double as normal clothes, they're ideal for my current (and growing!) body. Even better, I haven't bought any additional maternity patterns since that first shopping flurry. Instead, I'm modifying straight size patterns that already fit well. Unsurprisingly, Cashmerette patterns top my list of easiest to modify. Both the Turner Dress and the Concord T-Shirt have been hacked to death for my maternity whims. 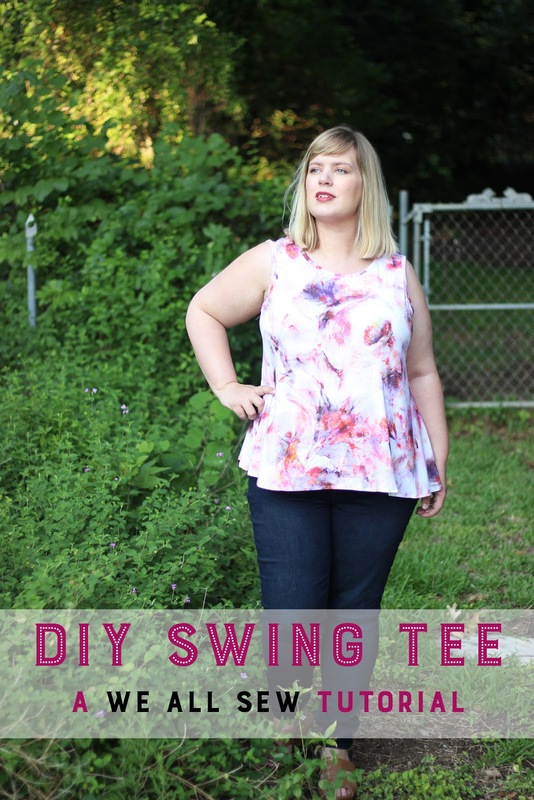 So much so that I wrote up two tutorials for BERNINA's We All Sew blog to share my favorite Concord hacks, a swing top and a classic maternity tee. *We have the loveliest group of local friends, many of whom have girls slightly older than ours. We couldn't be luckier! It's like having a committee of baby stuff fairy godmothers. Of all the non-maternity clothes that I've worn during pregnancy, swing tees have gotten the most mileage. I love them with jeans, when I'm not pregnant, and with pretty much every skirt or pair of trousers when I am. They hide a baby bump well, are super breezy in the Texas heat, and take an hour to whip up. Who could ask for more? When the Closet Case Ebony Tee came out, I insta-bought that pattern. The high-low hem and volume of swing kept me from actually making it up, however. It was perfect for my non-pregnant swing tee requirements, but not quite right for my maternity needs. Did I really want to print out and stick together an entire pattern that would need more fiddling? Absolutely not. I am already gestating a human. There's no energy to spare for needless hours of PDF assembly. Instead, I pulled the Concord T-shirt out and started slashing and spreading. I wanted the swing to start at the bust, to give some illusion of shape, and dropped the hemline lower to make up for that growing middle. It's a fairly quick adjustment and one that's proved invaluable to my maternity wardrobe. Thank heavens drapey, flowy styles are in fashion right now! All of my swing tops have been made up in rayon jersey, like this abstract pink one from Mood. There is no better fabric for hot, humid summers, y'all. Cool, breathable, and drapey, it makes that suffocating cushion of heat more bearable. I'm pretty sure that being extra super pregnant through the summer is the universe's way of giving my mom revenge for my own September-in-Florida birthday. Swingy rayon tops are a good way to survive now...and the next two months. 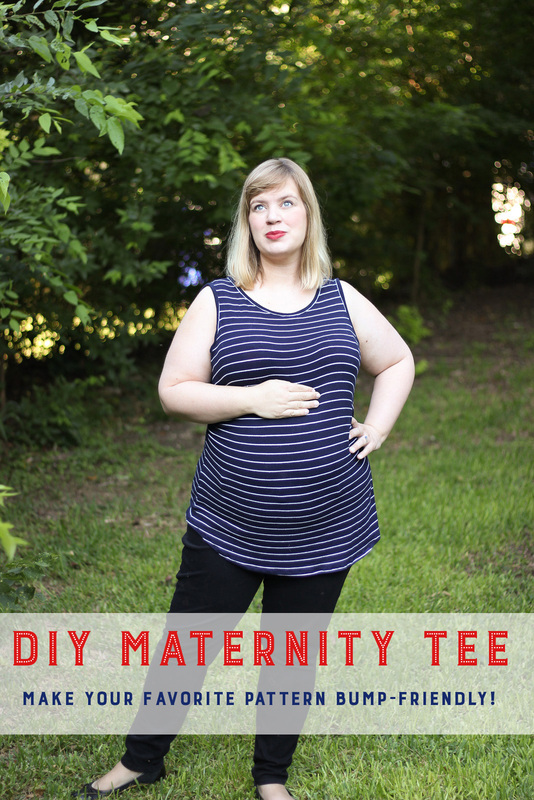 In the vein of true maternity wear, I've also whipped up a couple of classic maternity tees. You know the ones: long hemlines, ruched sides, enough room for the sentient watermelon attached to your torso. They sell for $25 a pop in stores, even though they're the simplest garments in the world. I just cannot bring myself to pay money for such shirts! They're practical and necessary, but sewing my own seemed much more reasonable. And cost effective. And less likely to make me resent polyester content in fabric. This adjustment may be even easier than the Swing Top hack. 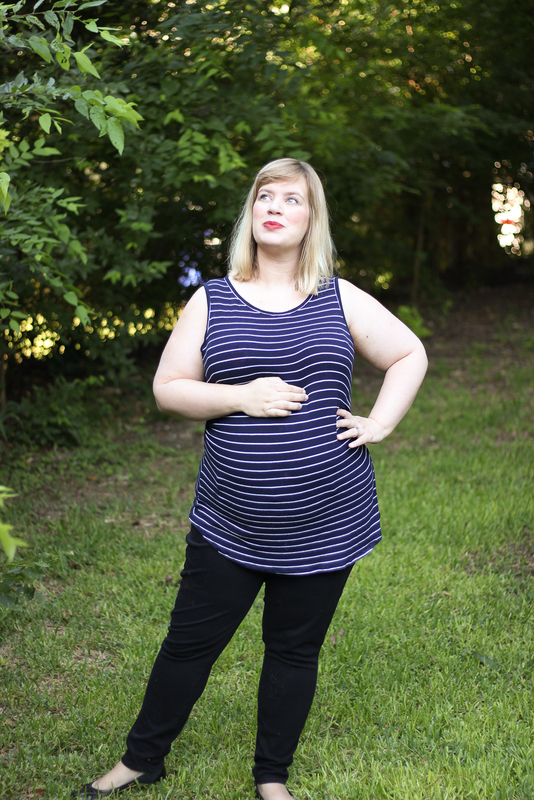 All that's needed to turn your favorite t-shirt pattern into a maternity top is added length to the front piece, which is then ruched up into the side seams. Voila! A watermelon pocket! I haven't put on any weight or changed base sizes (I've actually lost a bit, thanks to intense food aversions. 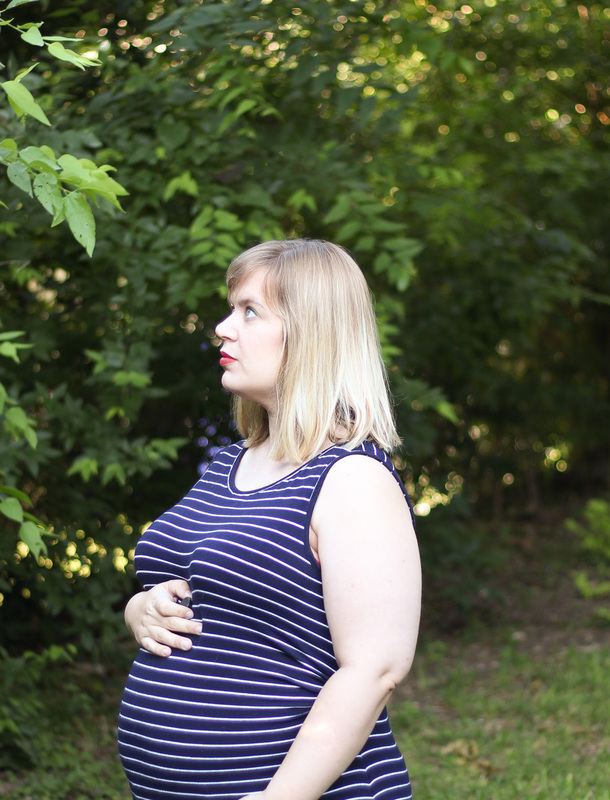 Oh, pregnancy brain, why have you forsaken bacon? ), so no added width at the hips is needed either. For the tunic length shirt in these photos, I added five inches of extra ruched fabric, plus another two to the center from hemline. It seems to work pretty well for my current size, with room to grow, but some bigger ones might be in the works later on. Once again, rayon jersey wins all the awards. 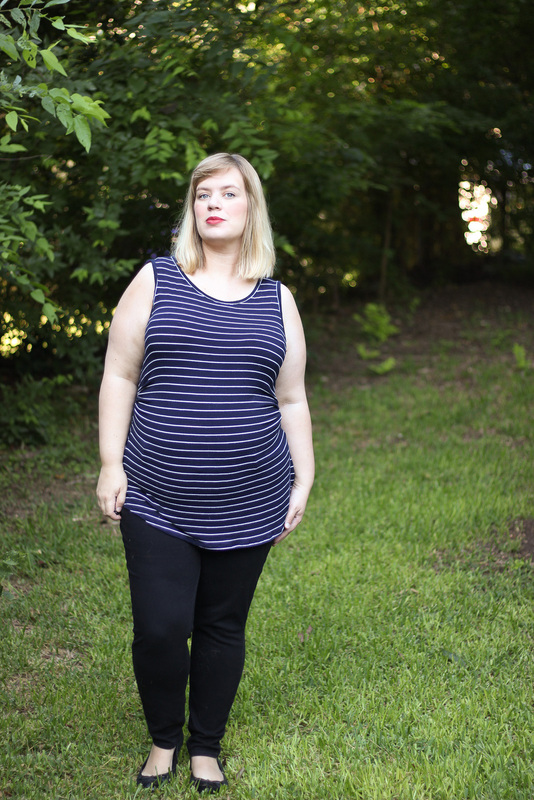 This is a striped navy rayon from Mood, which I've also used for a tank dress that is getting tons of wear. My solution to maternity wear is basically swathing myself in stretchy fabrics and calling it a day. Those vintage woven maternity patterns I bought early on may get zero use, this go around. In addition to these basic tees, I've also sewn quite a few dress variations, as mentioned. The Turner has become everything from a cold shoulder maxi dress to a slinky, but roomy tent dress for these steamy summer days. If anyone else is interested, I was actually thinking of turning those hacks (and a few others) into a series of YouTube tutorials. Given how few maternity patterns there actually are, especially as you go up in size ranges, using patterns I already love has been liberating. 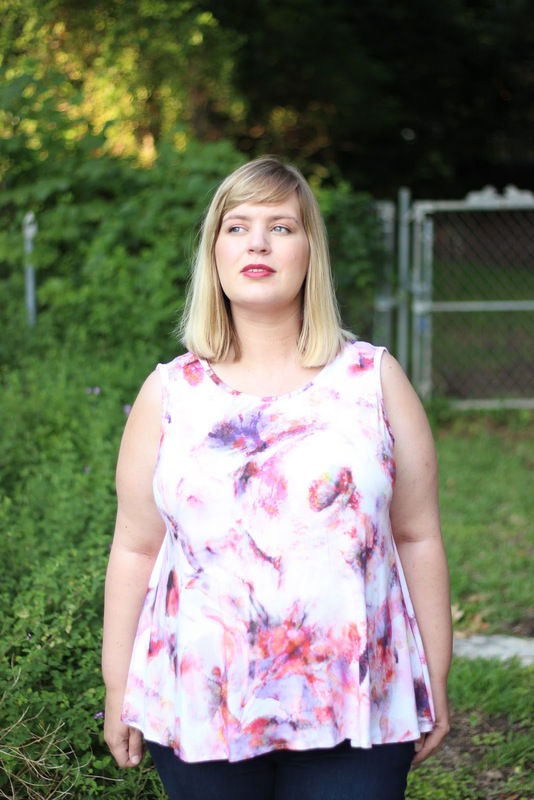 Ready-to-wear maternity garments are notoriously poor quality and the sizing can be so off on Big 4 maternity patterns (ahem, this Butterick dress) that pattern hacking is actually a far, far easier route. That's been my experience, anyhow. Now, back to the world of nursery set up. We're going to pick out paint, this afternoon, which is one of my least favorite renovation duties. The variances in the color yellow boggle my mind, kittens. How many times can one person mutter, "Hmm. A bit less buttery, a bit more lemony!" without losing her mind? We shall see. Wish me luck! Thank you again for all the well wishes, on my last post!